A national park right in the backyard of Washington DC. This is my local park and I hike and fish here often. 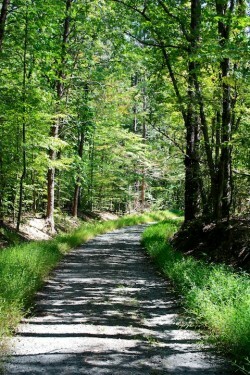 I use to hike often, traveling the great state of Virginia to hike new trails and old favorites. Recently, I have not been able to get outside as much as I once did. Responsibilities have changed and I just haven’t made the time like I use to. On Sunday Nancy had to take two finals so I hopped in my car and headed to Prince William Forest for a quick hike. Its close and offers some great trails. I managed to hike 6 miles starting from lot I. Headed up Taylor Farm Road then cut down High Meadow Trail to follow the creek along the South Valley Trail back to my car. 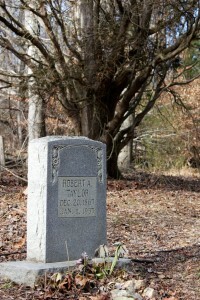 I found an old home site and grave yard on High Meadow Trail that I didn’t know existed. 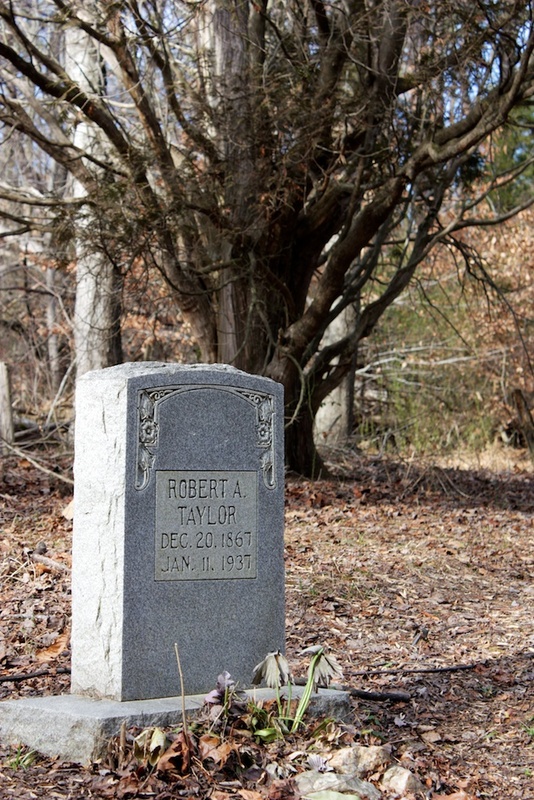 The only readable tombstone was of Robert A. Taylor so I am assume it was his land and old house site I found. The spot is a pretty good one too, couple acres of cleared land on top of a hill that would be prefect for a small family. The underbrush has grown over in the last few years but you can see where the house was and possible land for farming. 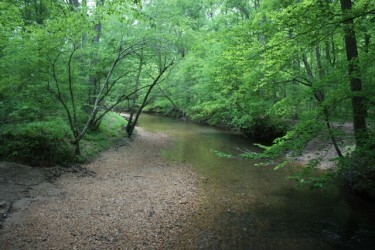 Later the long walk along Quantico creek was nice, I scoped out a couple fishing spots when spring comes. My hike was only a couple hours but it was nice to get away to some peace and quite on Sunday. Being cold and Christmas I ran into very few people which made the trip that much better. All I heard were a birds singing and squirrels playing in the leaves. It has been over a year since I last hiked in the park. Not sure why it took me so long to get back there, I guess I take it for granted living 10 minutes from the park. I took the opportunity on Sunday to head back and enjoy a leisurely stroll on a mild winter day. All weekend the temperatures were nice, Saturday it was actually hot when I was outside. I decided to take a few hours on Sunday and do a little hiking and enjoy the mid-50 degree weather. Nancy reminded me that I might not get many more opportunities like this one and to take it when I could. I wanted to park at the H lot but it was full so I went down to the next lot and hiked from there. This lot is where my friends and I would always park when we would go fishing. There is a service road that leads down to a fairly good size creek, which eventually leads to a small lake and the damn. I walked down the service road and took part of the South Valley Trail around the far side of the forest. I believe the last time I hiked this section, it was winter as well, so things looked exactly like I remember them. There are many low lying marsh areas and many naked trees out this way. I remember near the camp ground there was a fire that destroyed quite a few acres of land back here. 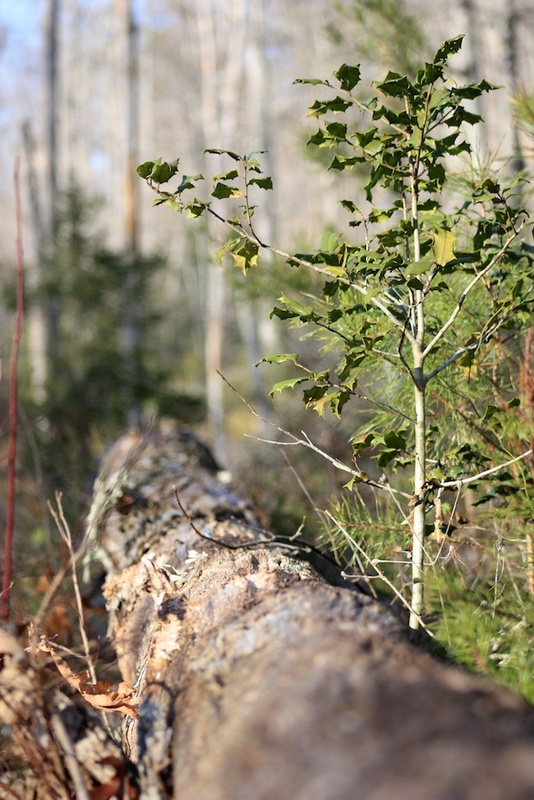 When I walked through it this time, the trees are still gone, but the forest has certainly started to recover. There are many saplings and tall bushes grow everywhere. You can still see the burned remains of tree stumps and logs. I would give the forest another year and you will probably not even know there was a fire. All of a sudden you will just walked from a dense forest into a more open area, not noticing the damage. I have always been amazed by a forests ability to recover from such a devastating disaster. In my regards, the forest is better off after a good fire. It clears out all the dead underbrush and lays down a fresh layer of fertilizer for new growth. Life goes on. Only 4.33 mile and it was over in a couple of hours. Monday came and the morning temperature was below freezing, this is the winter I am use to. I think if it snows again I will trek out to the forest like I did a few years ago. That hike was magical, the forest had a fresh blanketed of snow and not much disturbed by people. Just two days ago Nancy and I saw Jimmy Buffett for his annual, third straight year, Labor Day weekend show at Jiffy Lube Live. With Monday being a holiday I was looking forward to getting outside and doing a little hiking. I have not been able to get out and hike a local park since Spring so with a day off I thought what a better way to spend the day than outside hiking. The weather all weekend was beautiful after hurricane Earl, another reason to get out the last official weekend of summer. 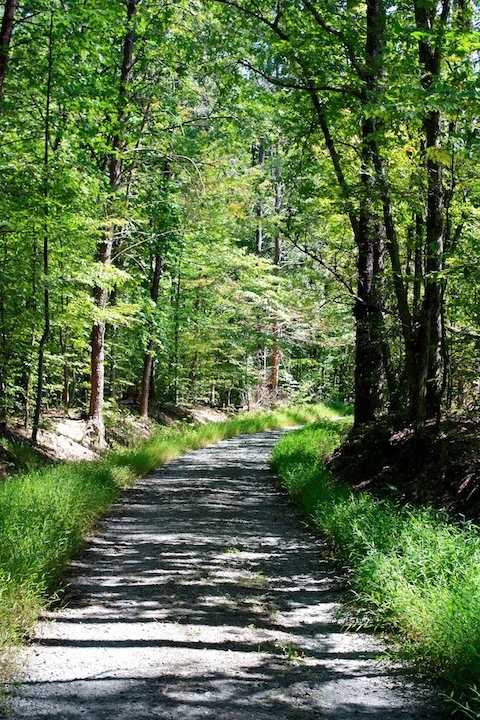 I was not certain of where I wanted to hike with so many options in the area, but I decided on Prince William Forest and its nearly 40 miles of hiking trails. The tree covered paths would provide some much needed shade and an opportunity to spot some wildlife. When I arrived to the park I headed to the main parking lot at the front. I figured I would hike the same trail I took during my snowfall hike in winter. The only change I made this time was when I got to the bridge I headed right and continued along the waters edge deeper into the woods. The water level was low but I wanted to get some shots of the dried out creek bed. I love to take shots during the various seasons in this park, seeing how it changes at the years go by. My journey was just over 4 miles long all said and done and it was a wonderful afternoon spent in the woods. I didn’t run into many people surprisingly so it was a quit hike. Nature was alive around me, singing goodbye to the summer. I am hoping to put together a Fall hike in the Shenandoah in October. I put some feelers out but have gotten only one response. I unfortunately have not gotten out nearly as much as I would like this past year. The few times I have been hiking have certainly been high quality hikes in my opinion. 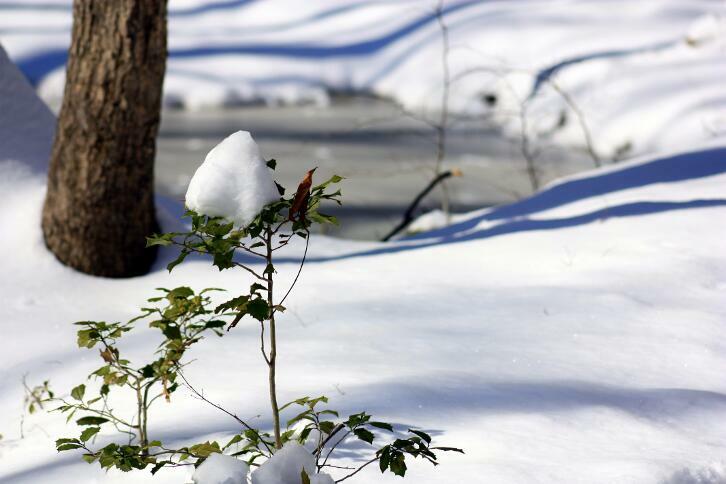 The snowfall hike at Prince William Forest and the Pinckney Island Wildlife Refuge in Hilton Head were both fantastic. Another Saturday and another giant snow storm. Fortunately this time around the accumulation was not 22″, but a much more manageable 6-7″. Just like before it snowed all day on Saturday so I was stuck in my house trying to keep myself busy. On Sunday the snow was easy to remove thanks to my new shovel, no more bucket for me! 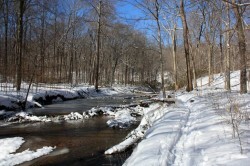 After a lazy morning I decided to go for a hike at Prince William Forest while the snow was still hanging in the trees and the ground was not to disturbed. I also thought it would be a great opportunity to take some pictures. I have been to the park in spring, summer and fall of course, but never after a winter snow fall. Compare the same bridge as seen during Spring and Winter. When I arrived I found the park was indeed open but the visitor center was closed and the gate leading into the park interior was closed. It made sense, who knows what the roads looked like inside the park, near the entrance they where at least plowed. My bright idea of visiting the park was shared by many others that day as the lots had over a dozen cars. I expected some people to be there, just not this many. While hiking I ran into several people on the trail, most of them on cross country skies. We don’t get much good snow fall in the area so they where taking every opportunity to get some skiing in. Getting a relatively late start, the skiers and other hikers packed the snow pretty well so I didn’t have to hike through 6″ of virgin snow. I was actually hoping to find a little that I could hike through, but as far as I went into the park someone had always been there before me. For a couple of hours I walked several miles through the park. I was amazed at just how quite the park was, very tranquil and serene. There was no noise form other people, or cars and most of the animals were hunkered down for the day because of the snow. Actually it was kinda fun at times I would see loops of animal tracks in the snow, but for the most part there was no sign of life. The trails I took eventually dumped me off at the main road. I thought taking the road back to my truck would be easier and shorter than walking back through the forest. When I was able to look at a map it was the furthest from the truth. I should have just backtracked on the trail. It would have been much better scenery and I could have avoided all the cars that started to flood into the park when the main gate was opened. Most of these genius didn’t take the time to drive slowly on the icy roads. Having hiked in the snow only once before, this was definitely a lot of fun. The last time there was only a dusting on the top of Robertson Mountain. Sunday in Prince William Forest was 6″ of wonderful snow and a heck of a lot closers to my house. What a strange weekend this turned out to be. For weeks it has been raining on and off here in Northern Virginia, most weekends has been less than stellar when it comes to rain. Some days it rained for 24 hour straight and days would go by without seeing the sun. Not having hiked for several weeks I was determined to make a go of it this past weekend. On Saturday I knew it might rain, but the forecast called for afternoon showers, so it was possible to get a hike in before the rain came. I first had to stop by work for a few hours. Rocky Patel was in town and he was doing a BBQ at our Potomac Mills location. It was also a good excuse to get some food before I headed south on 95 to Prince William Forest. By about 1 I left and 20 minutes later I was in the park. I wanted to hike some place different this time and I had a lot of trail to choose from. With 37 miles of trails there are still a lot for me to hike and explore. 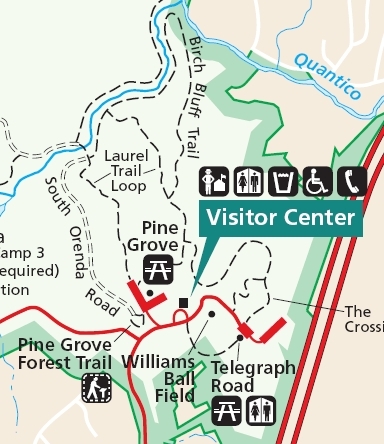 As a matter of fact I have never been to the visitor center or the trails around it. The visitor center provides a check-in, usually the main gate is not staffed, and has the largest parking lot in the park. Large open areas with tones of picnic tables provide a great location for families and large gatherings, there is even a baseball field. Many of the picnic tables are shade covered and provide the ideal setting for a summer afternoon picnic. Here is where I decided to park and head out from, hiking down part of the Laurel Trail Loop and Birch Bluff Trail, finally ending back near the visitor center. 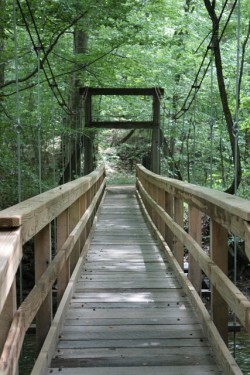 The trail itself is very much like the rest of the park, a classic piedmont forest trail. There are trees and wildlife all around that provide both visual and audible stimulation. With it still being spring and pretty cool out the birds where out in full force and despite my best efforts I couldn’t spot any in the trees, I certainly could hear them however. One interesting land mark I found was a wooden bridge that lead across the creek connecting to the North Orenda Road. This spot provided me with a wealth of pictures. I attempted to shoot from every angle and both sides of the bank, using both my wide angel and zoom lens, in shade and sun. There was just something about that bride being nestled in the forest that was a perfect setting. I was fortunate enough to snap a few shots while a couple walked across, not sure if they knew I was there or not. When I got back to the visitor center I was not ready to head home, I had hoped the trails were longer. I did find a small trail tucked in the woods right next to my truck that I hiked, the Pine Grove Forest Trail. First thing I noticed was the trails surface, it was not dirt or wood but 6000 recycled tires. Somehow they shredded all these old tires and glued them together to form a 4′ wide trail that snakes through the forest. The trail was very comfortable to walk on, every step felt like I was walking on a mattress. If you have joint problems this .2 mile hike is perfect for you. This short trail highlights the three distinct sections of a piedmont forest and culminates with a large deck over looking a tiny creek. The deck is on stilts and you feel like you are floating in the tree tops looking down on the forest floor. The deck does provide a nice places to relax and watch nature with it’s many benches and tables. I enjoyed some food here while I soaked up the sounds of nature all around me. Another great hike in the forest.